I can saw your logs at my place or yours. 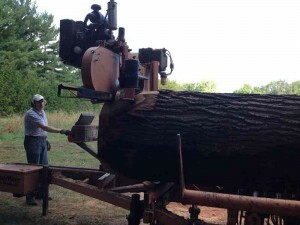 The sawmill is portable, but does take a bit of time to set up and take down. It is normally more economical to bring me one or two logs to saw but have me come to you when transporting a quantity of logs is an issue. 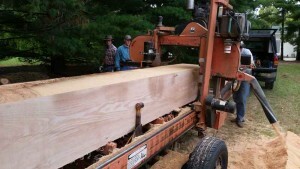 I can saw your logs into 1/8″ veneer or 18″ square beams up to 21′ long. With pricing starting at $.25 per board foot, you’ll not find a cheaper source for lumber. Kiln drying, surfacing and straight-line ripping is also available. Call for details. Here is a photo of what is probably the largest log I’ve sawed – 38″ diameter X 12′ black oak which produced about 800 board feet of lumber. Squared off version of probably the largest log I’ve sawed – 38″ dia X 12′ black oak that produced about 800 board feet of lumber. Pricing is determined at $60.00 per hour which does include my drive time if I mill at your location. Typical logs take between 1/2 hr and 45 minutes to mill. I keep the mill set-up at my shop usually, so if you can transport logs to me it keeps the costs down. With my well-equipped woodworking shop, the possibilities of services are endless. Commonly, I edge-glue your panels and machine sand them to down to 320 grit. I can manufacture your custom stair parts. I built and installed kitchen cabinets in a new home from trees cleared from the lot that the house was built on.